This photo of the school band at Derby Grammar School in Derby, Maine, was taken around 1927, and I posted an enlarged version because of all the interesting details. The instruments were each percussion of some type. The girl in the center of the front row was holding a baton, so she was obviously the drum majorette. To the right of her is my Dad holding two sticks that I may have played 35 years later at that same school. Other instruments of note are maracas held by the 3rd boy from the left in the front row, and 4th from the left in the back row. 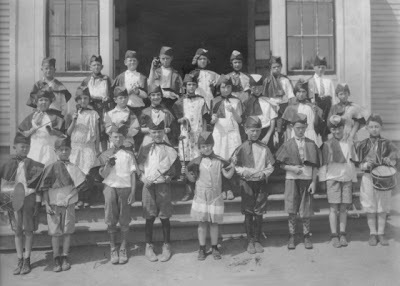 The 3rd boy from the left in the middle row has cymbals which are barely visible just above the hat of the boy in front of him. The girl in the center of the middle row is holding a tambourine. Other details provide a delightful look into grade school fashion just prior to the Great Depression. The variety of shoes, boots, sneakers, long socks, short socks, no socks, or pants and dresses makes an interesting perspective of the era.